WinLicense is a powerful protection system designed for software developers who wish to protect their applications against advanced reverse-engineering and software cracking. Developers do not need any source code changes or programming experience to protect their applications with WinLicense. WinLicense offers the widest range of options and features to create both trial and registered versions for an application. Developers can communicate with WinLicense to check the current state of the trial or registered versions of their application through a complete SDK. 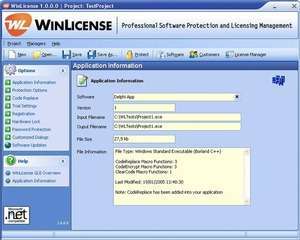 WinLicense 1.960 is a shareware program and can be used as a demo to try the software until the free trial period has ended. A full version of the program is available after the trial period ends. For security reasons, you should also check out the WinLicense download at LO4D.com which includes virus and malware tests. Additional screenshots of this application download may be available, too. WinLicense has a presence on social networks.